The Optimum FWP25 Work platform has been designed to safely carry out tasks of short duration and occasional usage with a forklift truck, such as maintenance or stocktake. Manufactured strictly in accordance with AS 2359.1 the type FWP25 Work Platform is suitable for a maximum of two people. 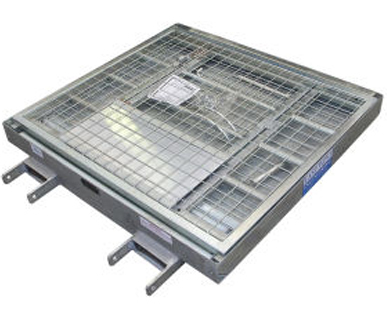 Supplied standard as a "Flatpack" for on site assembly, or may be supplied fully assembled upon request. 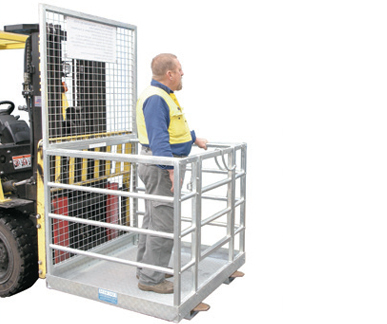 The Optimum WP-MS Work platform has been designed to safely carry out tasks of short duration and occasional usage with a forklift truck, such as maintenance or stocktake. Manufactured strictly in accordance with AS 2359.1 the type WP-MS Work Platform is suitable for a maximum of two people. NOTE: The use of this Work Platform on a Forklift truck should not be considered if the lift capacity of that Forklift is less than 1860kg for a counterbalanced type or 1116kg for a straddle type Forklift. Optimum Zinc Plated Work Platform is a fully welded construction, the WP-G Work Platform is supplied ready for use. The upper protection panel is bolted into position, being removable for transport and storage purposes. 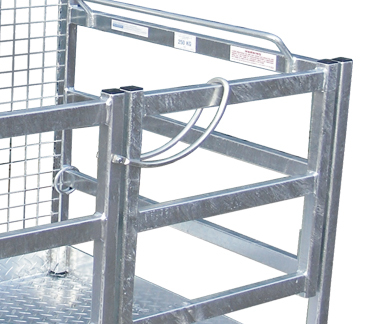 The Zinc Plated Work Platform is fitted with a self closing gate and bow lock for added security. Slipper pins are supplied to secure the cage to the forklift tines. 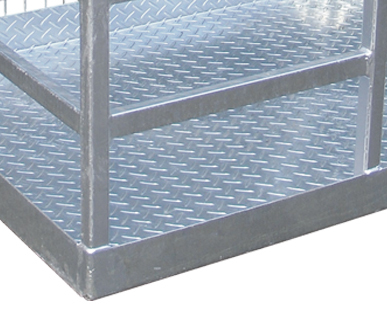 Zinc Plated Work Platform is fitted with a self closing gate and bow lock for added security. NOTE: The use of this Zinc Plated Work Platform on a Forklift truck should not be considered if the lift capacity of that Forklift is less than 1860kg for a counterbalanced type or 1116kg for a straddle type Forklift. If you'd like more information or if you have any enquiries about the Zinc Plated Work Platform, please call 1800 066 008 or click HERE to contact us online and we will contact you. 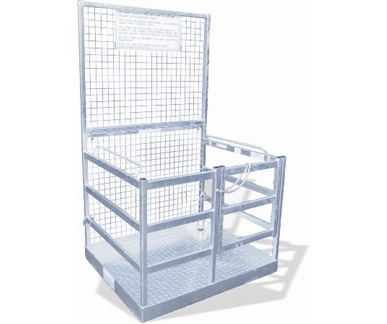 The Optimum WP-OP Order Picking Cage, suitable strictly for "Order Picker" or "Stock Picker" fork trucks. The WP-OP Order Picking Cage is tailor made to suit individual Forklifts and applications. 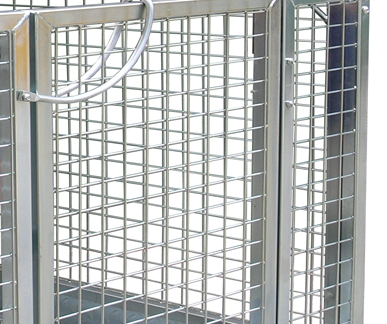 Designs vary from a standard cage to include parcel tray (shown), head protection guards, wheels, swinging and sliding access gates. 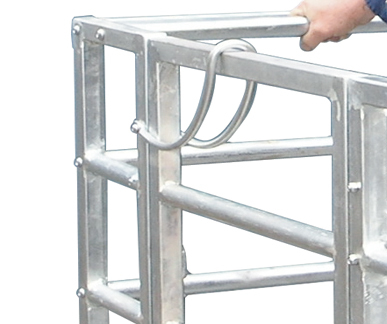 Full width outward opening gate, enabling access to stock where required. Suitable strictly for "Order Picker" or "Stock Picker" fork trucks. 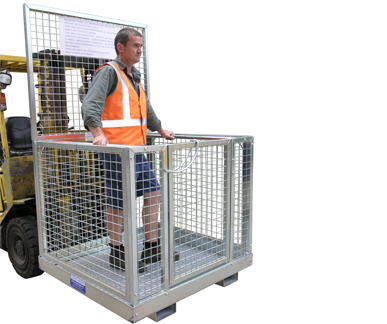 *** Manufactured strictly in accordance with Australian Standard AS 2359.1, the Optimum WP-OP Order Picking Cage must only be lifted by a dedicated ‘Order Picking Forklift’. 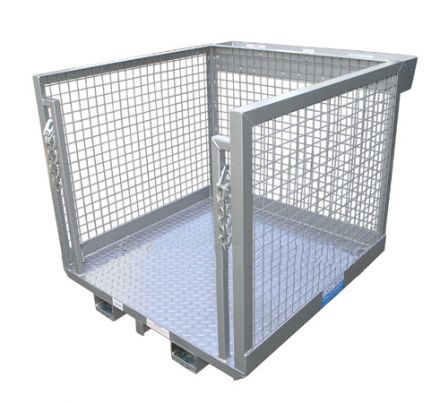 The load capacity of the Forklift will restrict the actual load capacity of the Order Picking Cage.